Embodied theories of language propose that the way we communicate verbally is grounded in our bodies. Nevertheless, the way a second language is conventionally taught does not capitalize on kinesthetic modalities. The tracking capabilities of room-scale virtual reality systems afford a way to incorporate kinesthetic learning in language education. Words in Motion is a virtual reality language learning system that reinforces associations between word-action pairs by recognizing a student’s movements and presenting the corresponding name of the performed action in the target language. Experiments with Words in Motion suggest that the kinesthetic approach in virtual reality has less immediate learning gain in comparison to a text-only condition. However, virtual kinesthetic learners showed significantly higher retention rates after a week of exposure. Positive correlation between the times a word-action pair was executed and the times a word was remembered by the subjects, supports the premise that virtual reality can impact language learning by leveraging kinesthetic elements. 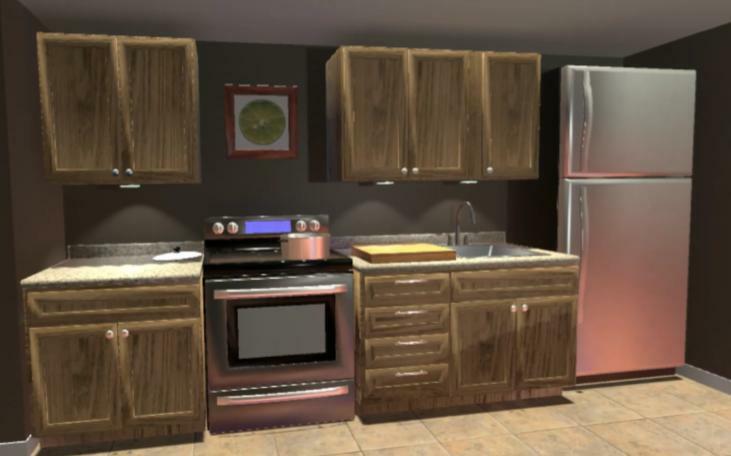 Virtual Kitchen environment for game supported by Word in Motion system. Student performs a set of actions in the virtual environment.